Troy's mom passed away on September 4th. We went to Arizona for the funeral, and my kids were devastated. All of the grand kids sang at the funeral service, and about mid-way through the song, Thaddeus just started to sob. The service was really nice. Matt (Troy's older brother) and his wife Jessica gave the life story of Kathy. There were a few funny ones from when she was growing up. When Kathy started getting more sick, she had a book made about her life. We got a copy, and it's full of pictures from her childhood. She also wrote a message to each of her grand kids, so that was really neat. After the funeral service (held in Chandler, AZ), we hopped in the car to travel to the cemetery (in Safford, AZ) where she would be buried. Troy dedicated the grave, and the kids each placed a flower on the casket. Then we got back in the car to begin the long trip home. We basically drove, cried, drove, cried, drove, cried. 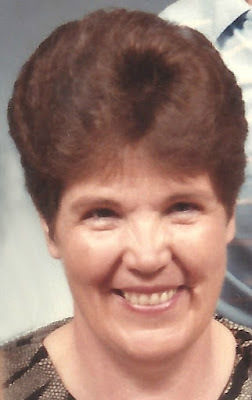 Kathryn Harris Bingham, born June 18, 1947, was called home Monday, September 4, 2017. Kathy led a very happy, active life filled with family, church, and service to others. Known for her love of her Savior and kindness to others, she will be missed by all. She is survived by her husband, Justin and her three kids, Matthew, Troy, and Marie. Her legacy will be carried on through her 12 grandchildren. Funeral services are Monday, September 11, 2017 at 10 am, preceded by a visitation at 9 am, at the LDS church at 1950 W. Galveston St. in Chandler. Burial will follow that evening at the Safford, Arizona Cemetery. In other Bingham Family News: school started. Kids love it. They're basically on vacation when compared to the school system we just came from. Plus, both of the schools work in an hour of homework/tutoring DURING THE SCHOOL DAY. So my kids aren't overloaded with homework. It's pretty sweet. Troy's job is going well. He's super busy, and he likes that. I've been getting the house set up and decorated and unpacked. I am almost done. Actually, I just finished sanding down a table THAT I BUILT ALL BY MYSELF from leftover scrap wood and mouldings. Now I need to prime and paint that sucker. I'm debating adding an extra shelf on the bottom, but as of now, I am undecided. THE END.